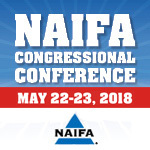 Join the 2018 NAIFA Congressional Conference! May 22-23, 2018! REGISTER NOW! NAIFA’s annual Congressional Conference establishes and cultivates relationships with lawmakers, to share the expertise of NAIFA members from all 50 states, and educate them on the value that NAIFA members bring to their clients and the solutions they provide for 75 million American families. Click Here to Visit the NAIFA Website to Learn More! ← Santa paid a visit to Real Wealth®!